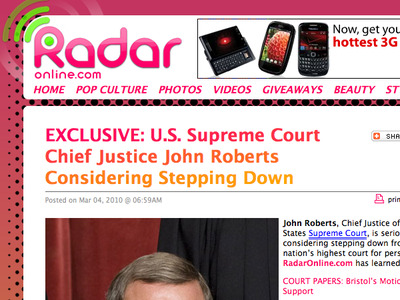 Update: RadarOnline.com has obtained new information that Justice Roberts will NOT resign. The justice will be staying on the bench. Original post: If this is true, “shocked” would seriously understate our surprise. Roberts is conservative, has only been on the High Court bench since 2005 and is only 55. So leaving the Supreme Court to allow Barack Obama to nominate the next Chief Justice and swing the court back (if you include Kennedy) to a liberal majority would be basically unheard of. We’ll certainly keep an eye on this one.